I have eaten kuih koci before but they are not like this one. 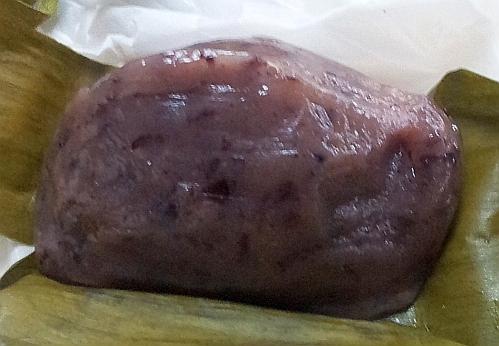 This kuih koci is made from black glutinous rice. It has coconut flakes filling. It is fresh so it is very tasty. 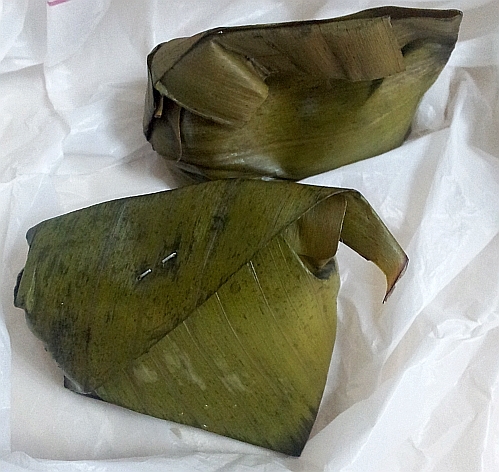 I bought it from a healthy food grocery shop located a few shops away from "Eat at J's cafe" in PJ. It is sold in limited quantities in bags of 5 for MYR 6.50 nett (MYR 1.30 nett each) so my friends and I bought 1 bag to share. I like it a lot so if I am ever in the area again, I will go and see whether or not they have this for sale on that day. This is how it looks like before it was unwrapped. I ate one and took one home for my mother to try. She likes it a lot too. Yes, it even feels healthy to be eating this. This kueh is one of the better ones but I seldom go to that area so don't know when I can get to eat it again. Especially when they are still warm and soft with lots of coconut fillings.. Best! yes but can reheat them if they have cooled down when bought. I only like the soft chewy outer part, not so much the grated coconut. Chew them together is nice! This I like but I prefer the kuih koci santan! Not easy to find good ones nowadays! 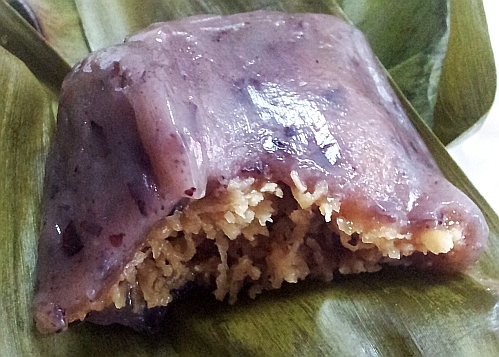 I think nyonya colours have this kuih koci santan. Let me go and look when I am there. This is made from black glutinous rice and is all natural colours.